Holler: "Mama, this boy, he gonna be a mess!" BO DIDDLEY was born on Sunday December 30th 1928, on a small farm located between the towns of McComb and Magnolia, in Pike County, Mississippi, USA. "You Can't Judge A Book By It's Cover"! "I remember standing in line at a theater in Washington, DC to see Bo. It was the winter of 1960, (and as cold as -; you insert the description.) I was on a weekend pass from the Army at Ft. Dix. My #3 hit record number "My Heart Is An Open Book" was still in the Top 100 at that time, but I was just another fan in line. I had always been a fan of Bo and wanted my Army buddy to see him too. It was cold, and a long wait, but well worth it. Bo "brought the house down". No one could lift your spirits like Bo and his famous guitar riffs. 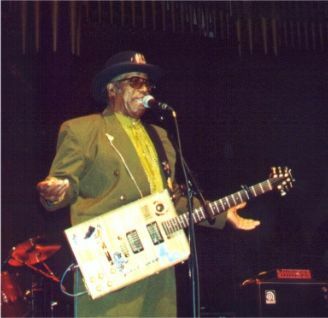 Long live Bo Diddley. HAPPY BIRTHDAY and thanks for the memories", Carl Dobkins, Jr.